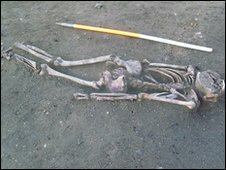 Roman artefacts and a complete 1,700-year-old human skeleton have been uncovered by workers preparing a building site in Lincolnshire. The skeleton was found at The Hoplands, in Sleaford, where North Kesteven District Council is building housing. The remains, pottery and animal bones will now be moved to Lincoln where they will be cleaned and assessed by archaeologists. The remains were first discovered in early 2009. Naomi Field and Mike Wood, two of the archaeologists looking after the find, said a larger excavation was then carried out. "We found a burial which is relatively unusual for a Roman site," Ms Field said. "Looking at the bones, it seems the remains were of an adult of about 5ft 5in (1.65m) in height," she said. Mr Wood said Sleaford was a Roman town with some "fantastically interesting" remains already discovered by archaeologists. "We hope to reveal a lot more about Roman Sleaford," he added. 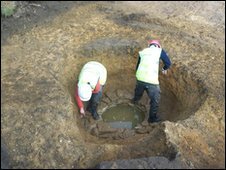 As well as finding the skeleton, Roman pottery was also uncovered along with rubbish pits and ditches marking property boundaries. Sleaford was a major centre for the local tribe known as the Corieltauvi. Mr Wood added: "The skeleton has had a very cursory assessment by a human remains specialist and we can now say it is the body of an older woman who was suffering from arthritis in her hips and lower back and had poor dental health." He said the woman would have been aged about 50 or older. Councillor Stewart Ogden said: "These interesting finds have provided glimpses into Sleaford's Roman past, allowing archaeologists to examine part of the Roman town." Gavin Glover, who is leading the excavations on site, said: "This is further confirmation that Sleaford was a very large and important settlement in the Roman period."